New to the OGX Beauty line, create an island girl escape in your shower with this ultra-moisturizing formula for thick to coarse hair. 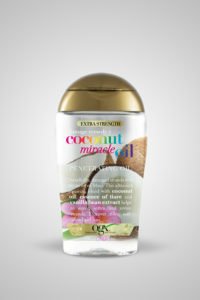 It helps repair, soften and revive damaged hair strands and discovers silky, soft island-inspired hair. This shampoo leaves hair feeling soft, luxuriously silky and smelling amazingly like an island retreat. Treat yourself to a hair vacation with Coconut Miracle Oil Shampoo. Apply shampoo generously to wet hair, massage into a lather through to ends, then rinse the hair thoroughly. After shampooing, follow with conditioner. For best results use in conjunction with other OGX Beauty products. I found this shampoo to be wonderfully hydrating and great for my thick hair. It helps to reign in the waves and leaves hair feeling soft and silky, especially when combined with the OGX Beauty Coconut Miracle Oil Conditioner. It is infused with a good amount of Coconut Oil, which is very good for the hair. Coconut Oil provides a lot of moisture for the hair and helps it look better than hair alone. This is one of my favorite OGX Beauty product lines. This conditioner helps revive even the most damaged strands and sends your senses on an island escape with Coconut Oil, Vanilla Bean Oil and Essence of Tiarre (Monoi). 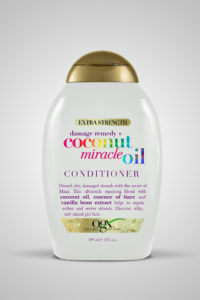 When used in conjunction with the OGX Beauty Coconut Miracle Oil Shampoo, the OGX Beauty Coconut Miracle Oil Conditioner helps to really soften, moisturize and hydrate thick, coarse and dry, damaged hair. It leaves hair feeling extremely soft and silky. After shampooing, apply conditioner generously to hair, working through to ends. Wait 3-5 minutes. Rinse hair thoroughly. For best results use in conjunction with other OGX Beauty products. I love the conditioner, it really left my hair feeling soft and silky, especially when used with the shampoo. Both of these together are very nice. It has Coconut Oil, Vanilla Bean Oil and Monoi Oil from Tahiti to help moisturize and hydrate the hair. All of those oils leave hair feeling extremely soft and silky, which is great for thick, coarse hair. This Penetrating Oil is the key to your island escape, to help revive your senses and your strands. This rich oil helps to calm frizz and tame flyaways, leaving hair silky soft and shiny. Apply a small amount to palm, rub hands together, then apply evenly to surface of damp (towel dried) hair working through to ends. For best results use in conjunction with other OGX Beauty products. Wow. The OGX Beauty Coconut Miracle Oil Penetrating Oil is something that you need if you have frizzy hair, flyaways or dry hair. It calms frizz, tames flyaways and quenches dry hair. I have very frizzy hair and I am always looking for something to help calm the frizz. This works quite well. Just apply to damp hair and work through. Then dry hair. Hair will look amazing. OGX Beauty is available at mass market retailers nationwide such as Walgreens, Rite-Aid, CVS, Target and Walmart. It is also available at Ulta Beauty and www.amazon.com. Like OGX Beauty on Facebook: https://www.facebook.com/OGXbeauty/; Follow OGX Beauty on Twitter:@ogxbeauty; Follow OGX Beauty on Instagram:https://www.instagram.com/ogx_beauty/ and Subscribe to OGX Beauty on YouTube:https://www.youtube.com/channel/UCw4yMx2iOcgycZlp_ydHTYw.